Sweet citrus shines in these colourful treats! I am an unabashed lover of all things lemon, to the point where other citrus fruits sometimes get a little neglected in my kitchen. I decided to remedy that by coming up with this orange-based recipe to serve to friends recently, and it was a huge hit. 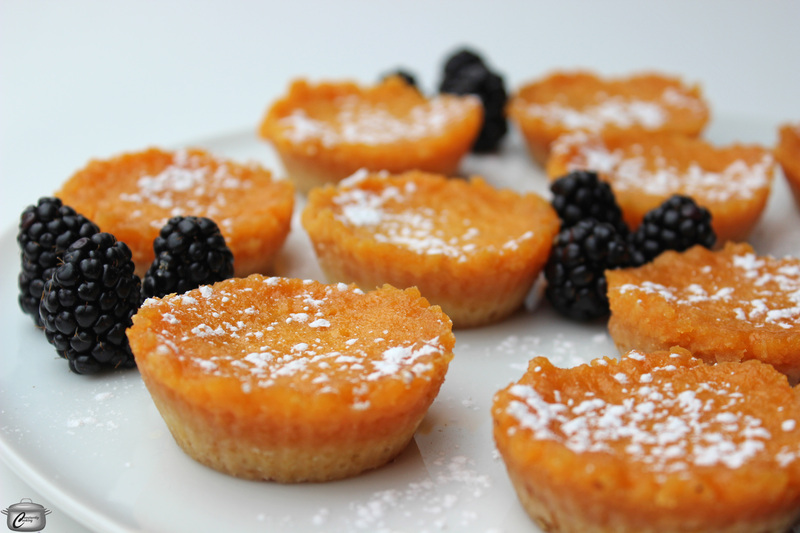 These little tarts would be ideal for a brunch menu, a springtime party or even a bridal or baby shower. You can use any variety of juicy orange that you prefer – blood oranges would be absolutely spectacular, I think! If you find your orange filling is looking a little pale and lemony in colour, you can always punch it up with just a few drops of red and yellow food colouring to give it a slightly more vibrant orange hue. You could easily use this same recipe to make grapefruit or lemon tarts, but you may need to taste the filling as it is cooking and adjust the sugar (adding up to 4 tablespoons / 60 mL) to compensate for less sweet fruit. The tarts can be made up to 48 hours ahead of time and refrigerated. Make the shortbread crust by combining the flour and sugar in a food processor. Add the butter and pulse until the mixture looks like coarse sand. Divide crust mixture among 12 lined muffin tin compartments (approximately 5 teaspoons / 25 mL each). 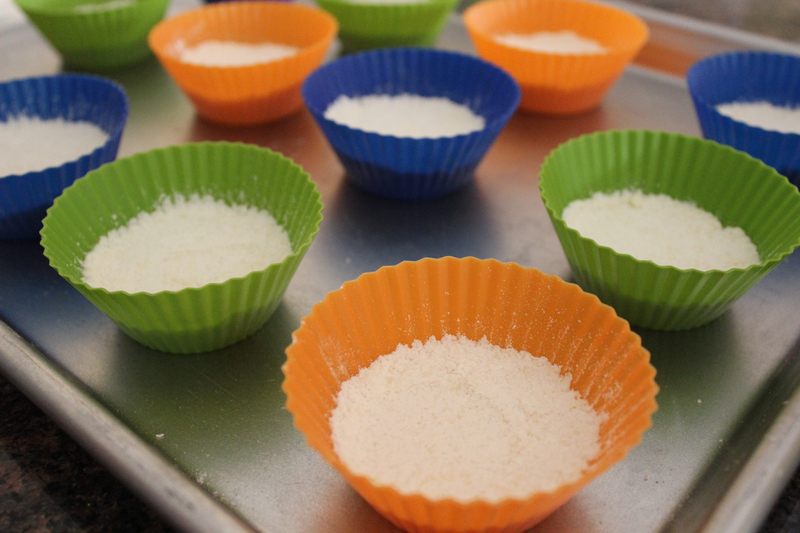 Press firmly and evenly into the muffin liners as shown above (I used silicone ones). Bake in the preheated oven for 15 minutes or until the crust just is just beginning to turn light brown. While crust bakes, prepare the orange filling. Put about 2 inches (5 cm) of water in the bottom of a double boiler or medium saucepan. In the top of the double boiler (or a heat proof bowl resting on top of the saucepan), place the sugar, egg yolks, orange zest and orange and lemon juices. Whisk well to combine. Bring the water in the pot to a gentle boil then reduce heat to medium, whisking the egg mixture continuously so the eggs will not cook too quickly (which could make them lumpy). After about 8 minutes over the hot water, the mixture should be smooth and slightly thickened. Remove the top of the double boiler (or the bowl) from the pan. Add the orange extract, if using and then the butter pieces three at a time to the egg mixture, whisking to melt and incorporate them. If you want the colour of the mixture to be more orange, whisk in a few drops of red and yellow food colouring. When the crusts are baked, remove the pan from the oven. Divide the orange filling evenly among the compartments then return the pan to the oven to bake for 12 – 15 minutes more. Cool the tarts completely and remove from muffin liners. When ready to serve, sprinkle powdered sugar over the top. This entry was posted in baking, Dessert, Desserts and tagged baby shower, bite sized desserts, bridal shower, butter, citrus, lemon, make-ahead, orange, Paula Roy, small pies, sugar, sweet, sweet treat, sweets, tarts, vegetarian. Bookmark the permalink. This looks fantastic Paula. And the picture makes me want to take a bite! Thanks so much, Susan! They really are delicious and easy! Making them again this weekend for sure. 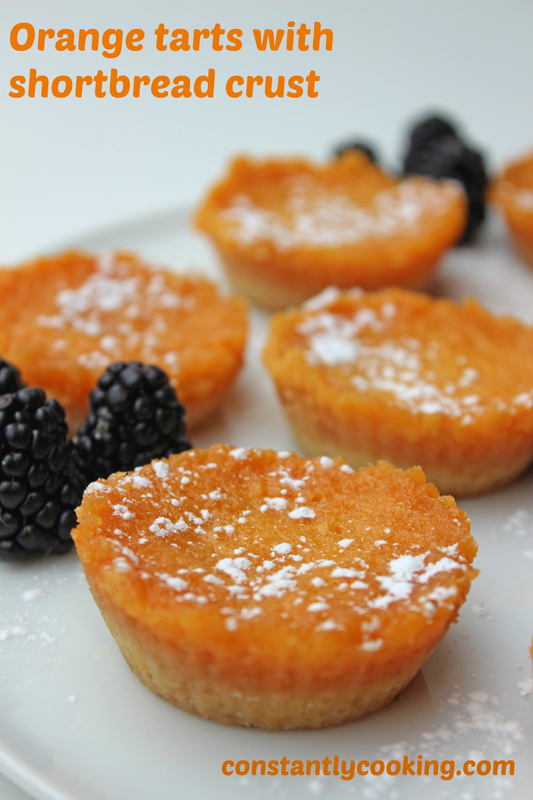 These orange tarts look gorgeous ! Thank you – they are as tasty as they are pretty! Thank you! I thought the same thing – why always lemon and never orange? These truly are as tasty as they are pretty. Rave reviews from my taste testers!